Emergency medicine deals with advanced life-support units and ambulance services under medical supervision and direction. People with this degree provide medical care to patients, interact with their families, bystanders and other rescue services personnel in a professional and efficient manner. To become a part of this field, you will have to enroll in an emergency medical care degree. 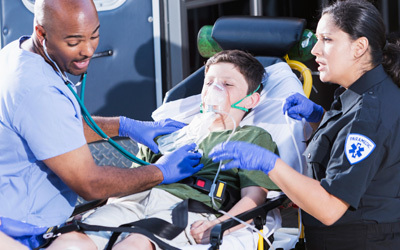 There are a number of colleges across the United States that offer emergency medicine courses. Students can go for various degrees in emergency medicine, depending on their preferences, education and relevant experience if any. The college you choose will also have an impact on their future. Bachelor of Science in Emergency Medical Care: There are only a few universities and colleges that offer bachelor degree programs in emergency medicine. This is a 4-year degree designed to train students to manage and lead in pre-hospital care settings. After the completion of EMT-B and paramedic training, the degree is concluded with a year of leadership studies. To be eligible for this program, you will need to submit your high school or college transcripts, a non-refundable application fee and test scores for standardized tests. Some colleges might have additional requirements, such as an EMT-B or a paramedic certification. Besides these, an emergency medicine program will also include basic level liberal arts courses. Bachelor of Science in Emergency Medical Management: Another option for people interested in going for a bachelor’s in medicine science is emergency medical management. This particular emergency medical course is not focused on the training aspect. It places a greater emphasis on preparing students for management, teaching and leadership positions in different healthcare settings. To apply for this program, you will need to have at least an EMT-B certification. In addition, some colleges might also ask you to include an essay or statement of interest in the program, high school transcripts, standardized test scores and letters of recommendation. If you are looking for a more advance emergency medicine degree program, you should look into graduate programs. This degr ee takes on a more advance take on the field of emergency medicine, preparing you for today’s competitive professional world of Emergency Management Services (EMS). The curriculum presents a comprehensive foundation of the disaster cycle, along with establishing broad basics for the components, systems, background and stakeholders involved in the management of disaster situations, whether natural or manmade. In addition to the above courses, a PhD program would include a variety of mandatory practical assignments, internships and training sessions. You may be placed at different medical centers, clinics and hospitals to get firsthand experience relevant to emergency medicine. Graduation from College is Not Enough! If you want to practice emergency medicine, just a degree from a medical college will not be enough. Once you have graduated from college, you will be required to complete a residency program, which typically takes three years to complete. Within this period, residents complete emergency medicine rotations in various specialties, shadowing experienced emergency personnel. After you finish your residency, you need to be licensed. For this you will need to take and pass a national licensing exam, typically the United States Medical Licensing Examination (USMLE). Keep in mind though, that licensing requirements may vary from state to state. Pharmacology course: This course revolves around the uses of pharmaceutical medicine in emergency situations. Hybrid programs in this discipline are usually available at the associate level. Higher degree levels require substantial practical participation, therefore are difficult to complete online. According to the US Bureau of Labor Statistics (BLS), the 2012 median pay for EMTs (Emergency Medicine Technicians) and Paramedics was $31,020 per annum. The job outlook between 2012 and 2022 is 23% is expected to be more than twice the national average for all occupations. EMTs may be required to work both indoor and outdoor. The work itself is physically strenuous and can be stressful. Life-and-death situations might become a norm. EMTs may also sustain injuries due to the nature of their job. They have to do a considerable amount of kneeling, bending and lifting and could be exposed to contagious diseases or might sometimes be injured by mentally unstable or combative patients. These risks can, however, be reduced by following proper safety procedures. A special prayer exists for EMS professionals written by L. Lipps. The Star of Life created by Leo R. Schwartz stands for six tasks – Detection, Reporting, Response on Scene Care, Care in Transit, and Transfer to Definitive Care. Q:What is covered in the PhD in emergency medicine? A:A PhD in emergency medicine will cover different theoretical courses and clinical courses to enable students top prepare for advanced careers in this field. Some of the subjects you may cover include: infectious disease, emergency wound management environmental injuries, musculoskeletal disorders, endocrinology, toxicology, and pediatrics. The format and exact coursework may vary from institute to institute. Q:What is the program objective of a masters in emergency medicine? A:This is a graduate program designed to provide students with training and in-depth knowledge of emergency care in healthcare settings. The program will focus on research, promotion of health, and emergency care in a variety of healthcare settings such as hospitals. Students will learn about the practice of emergency medicine. Q:What are the basic courses that I will study in the first year of a bachelors in emergency medicine degree? A:The first year or semesters are dedicated to helping students build a solid base of medical knowledge. Some of the courses you may encounter are: Pathophysiology, foundations of emergency care, pharmacology, MES operations, physical exam lab, physical assessment, cardiology, and assessment based management. The coursework will vary from college to college. Q:What are the different types of emergency medicine degree programs offered? A:You can pursue emergency medicine as an academic discipline at all levels of post-secondary education. Many colleges and universities are offering bachelor, masters, and doctorate programs in emergency medicine. The coursework, duration, and admission requirements will vary from program to program. All programs are designed to prepare students for managerial or clinical roles in emergency healthcare settings. Q:Can you tell me how emergency medicine courses online are completed? A:Online emergency medicine courses are covered with the help of videos, tutorials, online lectures, classroom conferencing, etc. You will need a computer and an internet connection to study online. However, due to the nature of the academic discipline, students may have to take a few classes on-campus for training purposes. Hands-on experience and practical training is an important part of the learning process. You can check with prospective schools to find out more about the program coursework.